Our goal is to include the latest news related to the integrated movement in the U.S. If there's a resource that we're missing, please let us know! Read this great post: AICPA Leads by Example by Larry Yu. and watch the video. 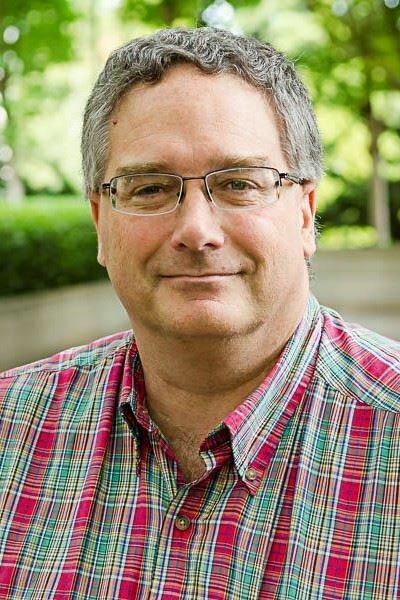 Bob Laux on Integrated Reporting in the U.S. CHECK OUT THESE UPCOMING IR EVENTS! Read this recap by Larry Yu and share your thoughts: Coca-Cola's Integrated Thinking: Does an integrated report need to be one report? Includes video of the first half of the program. Should CPAs be the conscience of the economy? Should FASB and IASB be responsible for setting standards for nonfinancial information? Join us Wednesday, Dec 12 at 2 PM EDT! The Association of International Certified Professional Accountants (the Association) was launched in January 2017, formed by members of the American Institute of CPAs (AICPA) and The Chartered Institute of Management Accountants (CIMA). 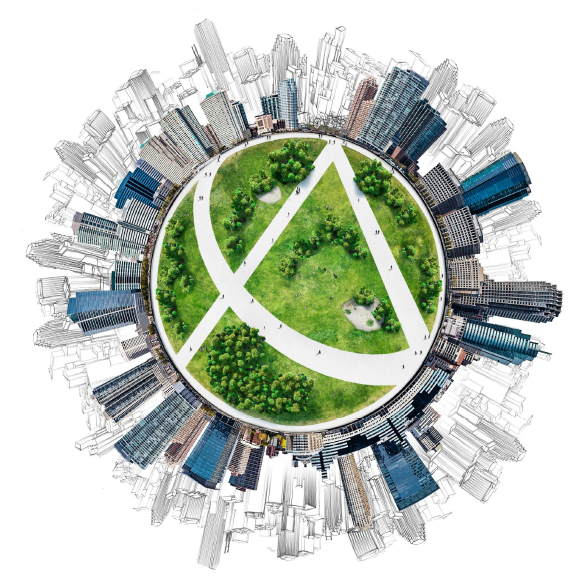 The Association presented its first integrated annual report in 2018 for fiscal 2017, its inaugural year. In this meeting we’ll hear about the Association’s approach to designing a report that tells the story of how the organization creates value, and lessons learned along the way. 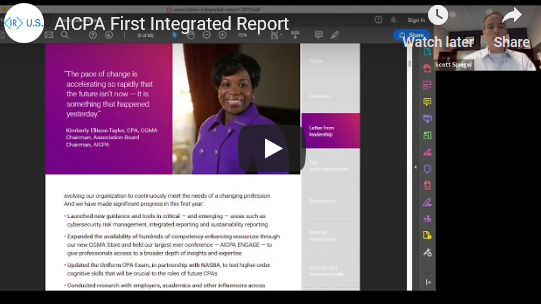 Integrated Reporting is on the rise in the U.S. Learn more and join the conversation at our next meeting! 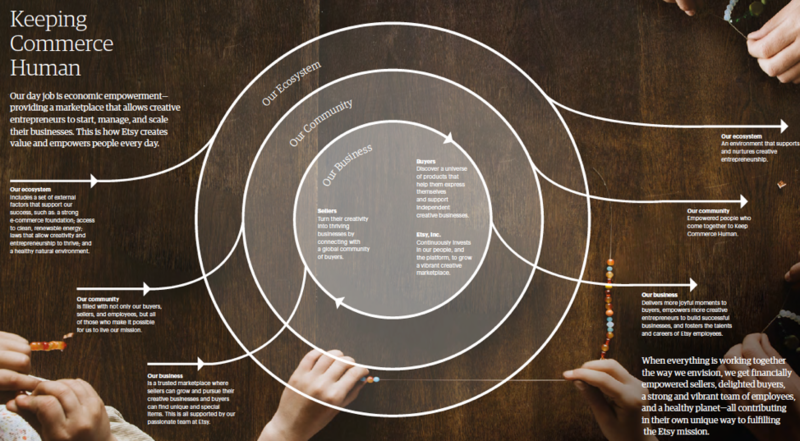 Read this recap by Larry Yu Keeping Reporting Human: Etsy’s Integrated Reporting Journey. Includes video of the first half of the program. Read this recap by Mary Adams New research on the economic benefits of integrated reporting quality. Discussion with authors Mary Barth of Stanford and Elmar Venter of the University of Pretoria. Post includes video and a link to their paper. Join us Wednesday, Nov 14 at 2 PM EDT! Coca-Cola publishes a short Annual Review and Sustainability Report. In this meeting, we'll hear from Jamal Booker, Reporting Manager of the Global Public Affairs, Communications and Sustainability function at The Coca-Cola Company. He'll share their approach to externally reporting on their integrated business, how their chaptered approach fits into their reporting strategies and lessons they've learned along the way. Read this recap by Rachel Ricardella: Breathing new life into annual reports: Intel’s reporting evolution. The post also includes a link to the video portion of the program. Join us Tuesday, July 17 at 2 PM EDT! As we often say, integrated thinking and reporting is a journey. And the U.S. companies on that journey are taking diverse and exciting approaches. In an effort to expand our list of sample reports in our community, we have formed a working group to find useful rubric to highlight different characteristics of reports. In our meeting this month, we are going to hear from Elizabeth Castillo, Assistant Professor at Arizona State University. Elizabeth assigned the rubric to her class. She'll share the results, highlighting key characteristics of 17 companies and organizations by her students. Then we hope to have a conversation about next steps that we can take as a community to build on this approach. Our goal is to expand our examples database and to continue to broaden the reach of our group and our message. Hope you'll join us! 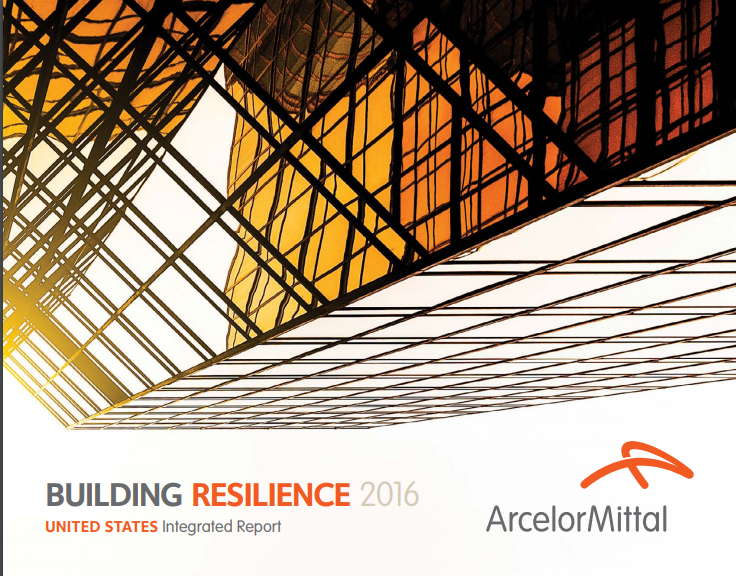 Read this recap by Larry Yu: The true story of ArcelorMittal, where the U.S. is leading the world in integrated reporting. The post also includes a link to the video portion of the program. 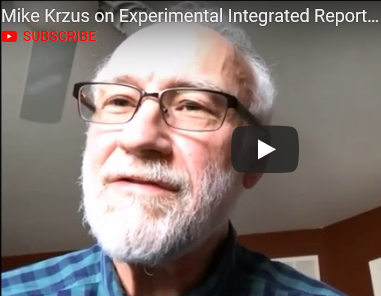 Read this recap (also thanks to Larry Yu): Why Mike Krzus thinks it’s not that hard to produce an integrated report. Here's the video portion of the program. Join us Wednesday, June 13 at 2 PM EDT! 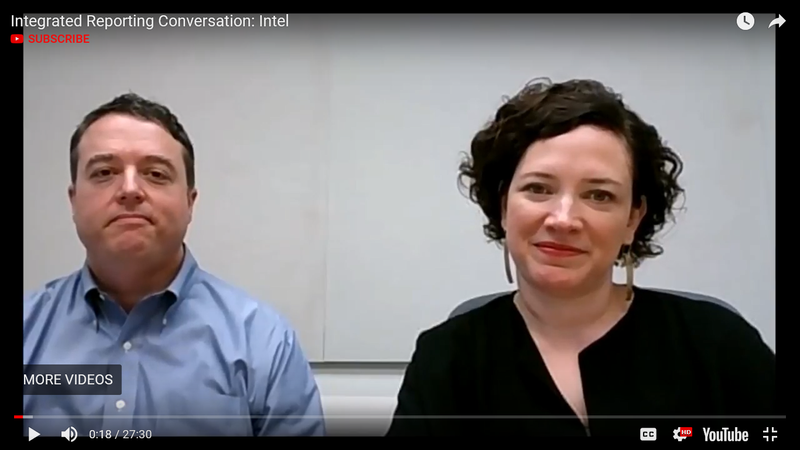 Erika Kelley, Intel external reporting controller, and Sam Roberts, financial reporting controller, will give us a guided tour of the latest Intel 10-K and share their experience with integrating their reporting. These programs include lots of conversation so join in! Our first live meeting of the Integrated Reporting U.S. Community in Boston was a great success! 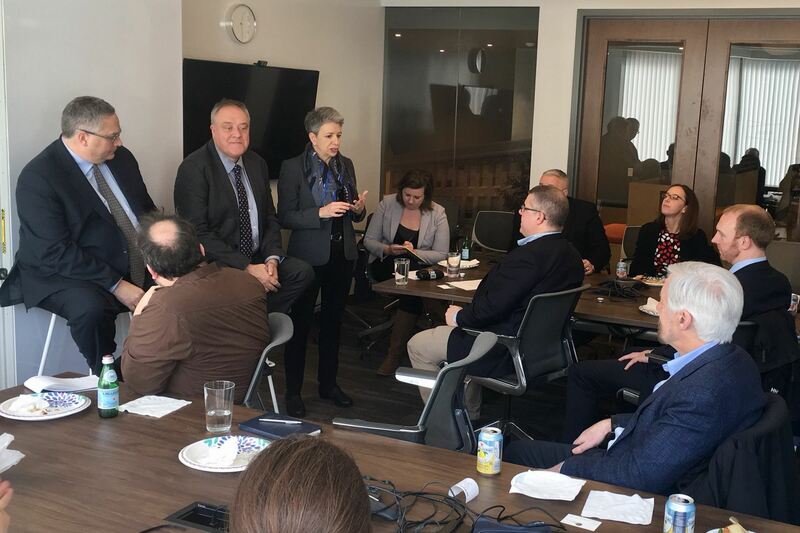 We attracted a diverse group of leaders from both Boston and New York to hear from Richard Howitt and Bob Laux about the progress of the integrated reporting movement in the U.S. and abroad. If you couldn't make it, see this great post Larry Yu summarizing our meeting. There's also a video of the virtual town hall that we held later that same day. J oin us May 9 2 PM EDT! 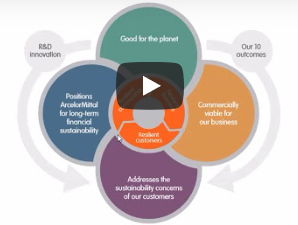 Beth Spurgeon, USA Corporate Responsibility Manager, ArcelorMittal will give us a guided tour of their reports and share her experience with us. Thanks to Mark Ohringer, JLL Executive Vice President, General Counsel and Corporate Secretary for a helpful discussion about the company's integrated reporting journey. As always, we had a diverse audience with good questions! See a video of discussion highlights as well as a great post by Kite Global Advisors called Along the Integrated Reporting Journey with JLL. Learn about the international movement which empowers organizations to think, plan and report the story of their business including financial, human, social and environmental capitals. Bring your questions, concerns and ideas to help us advance this movement together! Register for the Boston Lunch or the Virtual Meeting.